Google Maps has a bicycling routing option in beta. It does seem to do a good job routing in my town by using streets with bike lanes where possible and avoiding going up steep inclines directly. But I'm curious how it estimates travel time. For cars, it seems to use the speed limit with a proprietary fudge factor that uses historical and current traffic conditions. But for bicycles, what is it using to estimate travel time? There's considerable spread in terms of speed between the fastest Strava PR (personal record) seekers and the slowest bike moms with trailers - maybe even as great as 2-3x difference. Has anyone figured out what the algorithm seems to be doing in terms of cycling times? Does it take into account the user's own cycling speed? Has Google said anything re: this? The answer given by gammapoint is surely a nice estimate to take into account when looking at Google Maps. Unless, of course, you get yourself hired in that specific department in Google. All answers on the internet will be based on estimates on specific direction queries and will try to obtain some results from comparing different or similar routes. Yet, using even bigger data to estimate behaviour of complex algorithms is difficult to the point I'll say impossible. Provided Google is using neural networks or possibly even more sophisticated algorithms, such analysis is pointless. I'm sorry, but to find out your speed compared to Google estimates, you need to run the tests by yourself. Google assumes a baseline moving speed of around 16km/hr (10miles/hr) regardless of trip distance. but if you read more you can see there are adjustments to that baseline. For some routes where I've actually compared, I divide the Google cycling time by 1.5 to get an estimate of how long it would take me, but I used to race pretty seriously. Google and other traffic providers like Here (nokia) exchange traffic data, which is crowdsourced from cellphones. If you're plotted at 5 different points along a know main road and your average speed is 50 km/h there's a decent chance its smooth-flowing vehicle traffic. If you're riding at a snappy 30 km/h, then it could look like slow traffic. So your results get compared with other vehicles on the same road and direction at about that time. If you're roughly keeping up with the vehicles, then your trip could be detected as a car ride. I don't know how the apple ecosystem does it, but if you use android and google services, then visit https://www.google.com/maps/timeline to explore your locations and your day's travel. Some of the travel segments could be detected as a walk, a bike ride, a train, or a car. You can correct this info too, if you see fit. But google's map/routing engine doesn't use it, instead its just an average speed of the average cyclist over all roads. I can generally travel a route in half to 2/3 of the predicted time. 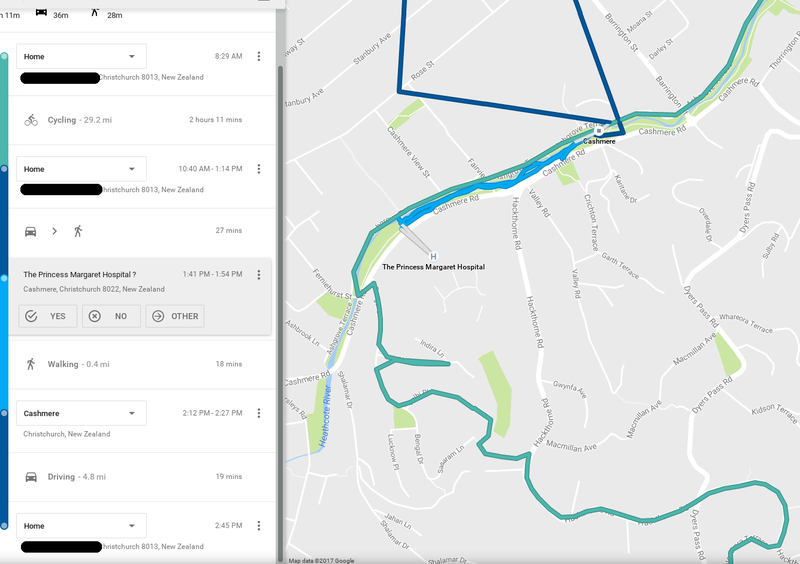 With respect to your last paragraph/question, I get the same route and (slow) timings whether or not I'm logged in, but I have quite strict privacy settings on my Google account (in particular location history is disabled) and I don't log rides in anything that uses Google maps (my Android bike computer app - IPbike - uses openstreetmap). If your settings and use of Google apps are different to mine you may want to run a test yourself logged in vs. a fresh browser profile. Not the answer you're looking for? Browse other questions tagged commuting-bike maps or ask your own question. How do you download OSM maps to Garmin Edge?